The phrasing “unanimous conclusion” again suggests that all 17 intelligence agencies are in accord, albeit without specifically saying so, a journalistic sleight of hand that raises further doubts about the objectivity and honesty of the Times on this issue. 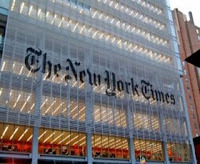 The Times’ belated correction — and its new deceptive formulation — underscore the growing sense that the U.S. mainstream media has joined in a political vendetta against Trump and has cast aside professional standards to the point of repeating false claims designed to denigrate him. Retrenchment or Retreat: What's Behind US Abandonment of al-Tanaf? The U.S. is giving up its hopeless position at the Syrian-Iraq border crossing near al-Tanf in south east Syria. The U.S. military had earlier bombed Syrian forces when they came near that position but it then found itself outmaneuvered, cut off from the north and enclosed in a useless area. Al-Tanf is in the blue area with the two blue arrows at the bottom of the map. It will soon be painted red as liberated and under Syrian government control. The U.S. plan was to move from al-Tanf north towards the Euphrates river and to thereby capture and control the whole south-east of Syria. But Syria and its allies made an unexpected move and prevented that plan. The invaders are now cut off from the Euphrates by a Syrian west-to-east line that ends at the Iraqi border. On the Iraqi side elements of the Popular Military Unites under the command of the Iraqi government are moving to meet the Syrian forces at the border. 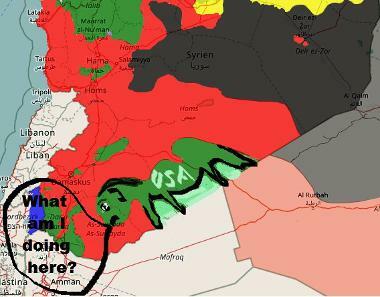 The U.S. invaders are now sitting in the mid of a piece of rather useless desert around al-Tanf where their only option is to die of boredom or to move back to Jordan from where they came. The U.S. military even moved a HIMARS missile launcher with 300 km reach from nearby Jordan to al-Tanf. That was a laughable stunt. It made no difference in capabilities from the earlier launcher position in Jordan just a few miles west. But someone the U.S. military believed that showing off such weapons in a doomed area would impress Syrian or Russian forces and change the facts of life. It didn't. It was clear that the U.S. would have to move out. Evidently Tanf FSA really are being flown to Shaddadi. Plan C is in effect. There were several rumors to this regard since yesterday and the above now confirms them. Lol indeed. About 150 or so U.S. trained Arab fighters will be flown from al-Tanf to north-east Syria where they will join the (hated) Kurdish forces. They may later try to reach the ISIS besieged Deir Ezzor from the north or get pushed into some suicide mission against another ISIS position. The Syrian army will approach and liberate Deir Ezzor most likely from the south and east. It is unlikely that it will let U,S. proxy forces take part in that. The U.S. contingent will move west out of al-Tanf and back into Jordan. The Syrian and Iraqi forces will take over the Al Waleed border crossing at al-Tanf and the regular commercial traffic on the Damascus-Baghdad road will resume. The various propagandists who argued for a big U.S. mission to occupy the whole Iraqi-Syrian border and all of east Syria have lost. The "Shia crescent" between Iran and Lebanon they claimed to prevent with such a move was never a physical road connection and certainly nothing the U.S could fight by any physical means. Their pushing for a U.S. occupation of east Syria and incitement of a larger conflict has for now failed. There are also well-known problems with the findings. There was no “chain of custody” – neutral oversight – of the bodies that were presented to the organisation in Turkey. Any number of interested parties could have contaminated the bodies before they reached the OPCW. For that reason, the OPCW has not concluded that the Assad regime was responsible for the traces of sarin. In the world of real news, only such a finding – that Assad was responsible – should have made the OPCW report interesting again to the media. For those who believe there are technical grounds for doubting Hersh’s account, I recommend this examination of the evidence (and the troubling lack of it) by Scott Ritter, a former weapons inspector in Iraq and an undoubted expert on chemical weapons. The Liberal government has tabled legislation to amend Bill C-51, the draconian law Stephen Harper’s Conservative government passed in 2015 in the name of fighting terrorism. Bill C-51 provoked widespread opposition, with even the Globe and Mail, the traditional voice of Canada’s financial elite, condemning it as a “police state” measure. The Liberals promised to “reform” Bill C-51 during the 2015 election campaign. But, barring a few cosmetic changes, the Liberals’ “National Security Act, 2017” (Bill C-59) retains all of Bill C-51’s attacks on fundamental democratic rights, while handing Canada’s spy agencies significant new powers. Bill C-59, like Bill C-51, empowers Canada’s Security and Intelligence Service (CSIS), the country’s primary domestic spy service, to actively “disrupt” alleged threats to national security and, if necessary, to use illegal means to do so. Prior to 2015, CSIS’s mandate was limited to gathering information on targeted groups and individuals. The Liberals’ bill places slightly tighter restrictions on CSIS’s disruption powers, including by providing a list of “permitted” illegal acts. Permitted acts include: restricting people’s movements, disrupting communications and financial transactions, and damaging property, as long as the damage does not endanger life or cause bodily harm. Bill C-59’s stipulation that CSIS obtain a judge’s approval for any action it plans to undertake that will violate a right contained in the Charter of Rights and Freedoms is worthless. The approval process will take place in secret courts, with no ability for anyone, including so-called “special advocates,” to act on behalf of the targets. Moreover, the decisions of these courts, including even the names of those targeted for “disruption,” will be forever sealed. Thus a body of secret national security law will be created to which the public will have no access, let alone the right and ability to challenge. Given the intelligence agencies’ record of systematically lying to the courts, Canadians should have little confidence that the judges engaged in such hearings will even be presented with all of the facts. Bill C-59 grants new offensive capabilities to Canada’s signals intelligence agency, the Canadian Security Establishment (CSE). CSE operatives will henceforth be authorized to wage offensive cyberwar attacks on foreign targets, including foreign states’ computer infrastructure and communications networks. This could include deleting or corrupting data, and planting malware on phones or other devices. CSE’s mandate has also been expanded so as to integrate its operations even more closely with the Canadian Armed Forces (CAF). The aggressive intent of these measures was made clear by Defence Minister Harjit Sajjan’s presence at the press conference at which the government unveiled Bill C-59. Earlier this month, Sajjan announced new funding for CAF cyberwarfare capabilities as part of the Liberals’ new defence policy. Under that policy, the government will hike military spending by 70 percent over the next decade to $32.7 billion and will expand military-security cooperation with Washington, including through the US National Security Agency-led “Five Eyes” electronic spying and cyberwar alliance. Under the Liberals’ “reform” of Bill C-51, the security agencies will have virtually unrestricted access to personal information collected by other government agencies. Bill C-59 also upholds the “national security certificate” mechanism under which “named” non-Canadian citizens can be arrested and detained indefinitely without the right to see and contest any of the evidence against them. It also retains “peace bonds,” under which terrorism suspects can be detained or have restrictions imposed on their activities without being charged with any crime. 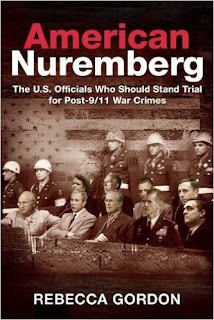 These moves are in keeping with the record of the Liberal Party, which was the chief architect of the antidemocratic measures, including unprecedented attacks on the presumption of innocence and the right to remain silent, adopted in the wake of 9/11. In 2015, Trudeau’s Liberals voted in favour of Bill C-51, claiming that they would repeal some of its provisions when they took power. Bill C-59 makes clear that such pledges were nothing more than electoral posturing aimed at capitalizing on public opposition to Bill C-51. Bill C-59 in fact expands CSIS’s power to store and analyze electronic data. Last year, a federal court ruled that the intelligence agency had broken the law by retaining data from Canadians who were not suspected of any crime. The new Liberal legislation specifically allows CSIS to make use of the information it obtains, in the course of its investigations, on people not suspected or accused of any wrongdoing. This outrageous attack on privacy rights is being justified as a necessary response to recent technological advances. The corporate media and several security and legal experts who were prominent critics of Bill C-51 are lauding the new civilian review mechanisms the Liberals are creating, claiming that they can be relied on to ensure the security-intelligence agencies do not violate Canadians’ democratic rights. In truth these mechanisms are nothing more than a fig leaf, aimed at providing the intelligence agencies with a legal-constitutional cover to spy on opponents of the government and big business—environmentalists, native organizations, leftist and antiwar groups, and above all the working class. Like the CSIS Security and Intelligence Review Committee, which it will replace, the new National Security and Intelligence Review Agency will be staffed with carefully vetted representatives of the ruling class. They will review intelligence operations only after the fact and submit their findings to the government, not the public. Bill C-59 also provides for a Security and Intelligence Commissioner, who will be drawn from the ranks of the judiciary. While the Commissioner is being publicly touted as a “watchdog,” in reality his task will be to work with the security agencies to establish legal cover for their operations, including CSIS “disruption” campaigns. One of the Commissioner’s chief functions will be to provide “pre-operation” approvals for their more intrusive and potentially politically contentious activities. Under a separate piece of legislation, the Liberals are creating a parliamentary oversight committee, whose members will be barred from reporting to the public on any illegal activities they uncover. Moreover, the government has wide powers to withhold information from this committee, including on all ongoing security-intelligence operations. The Liberals’ defence of Canada’s burgeoning national security apparatus is intimately bound up with their determination to pursue an aggressive, imperialist foreign policy. Bill C-59 was introduced just two weeks after Foreign Minister Chrystia Freeland delivered a keynote foreign policy address in which she vowed that “hard power,” i.e. war, must be a central part of Canada’s foreign policy. She pledged that Canada will deepen its strategic partnership with US imperialism, while working to uphold multilateral imperialist alliances like NATO. Freeland’s speech was followed the next day by Sajjan’s defence policy announcement, which included funds for an expanded fleet of fighter jets, fifteen new warships, the purchase of armed drones, and the recruitment of 5,000 additional military personnel. Such policies, which go hand in hand with a never-ending assault on the social position of the working class, cannot be implemented democratically. But as such propaganda increasingly falls flat, the Liberals will increasingly be forced to resort to outright state repression. Bill C-59 makes clear that the Liberals, no less than the Conservatives, are determined to expand the vast spying apparatus at the disposal of the Canadian capitalist state so as to suppress working-class opposition. Criticism of the Liberals’ bill among the political establishment has been muted. Predictably, the Conservatives denounced the government for “disarming” the intelligence agencies. The New Democrats (NDP), who voted against Bill C-51, complained that the Liberals had broken their election promises and not gone far enough in repealing its antidemocratic provisions. But the NDP has had nothing to say about the broader ruling-class assault on democratic rights since 9/11, of which Bill C-51 was only one element, or the Liberals’ determination to make aggression and war the centerpiece of Canada’s foreign policy. The New Democrats’ tepid opposition to Bill C-59 reflects their loyalty to the Canadian capitalist elite and its global imperialist interests. For years, Citizen Lab has been sounding alarms about the abuse of commercial spyware. We have produced extensive evidence showing how surveillance technology, allegedly restricted to government agencies for criminal, terrorism, and national security investigations, ends up being deployed against civil society. 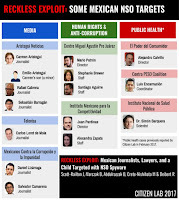 Working with Mexican civil society partners R3D, Social Tic, and Article 19, our team — led by John Scott Railton — identified more than 75 SMS messages sent to the phones of 12 individuals, most of whom are journalists, lawyers, and human rights defenders. 10 are Mexican, one was a minor child at the time of targeting, and one is a US citizen. These SMS messages contained links to the exploit infrastructure of a secretive Israeli cyber warfare company, NSO Group. Had they been clicked on, the links would activate exploits of what were, at the time, undisclosed software vulnerabilities in the targets’ Android or iPhone devices. Known in NSO Group’s marketing as “Pegasus”, this exploit infrastructure allows operators to surreptitiously monitor every aspect of a target’s device: turn on the camera, capture ambient sounds, intercept or spoof emails and text messages, circumvent end-to-end encryption, and track movements. The targeting we outline in our latest report, which runs from January 2015 to August 2016, involves a much wider campaign. 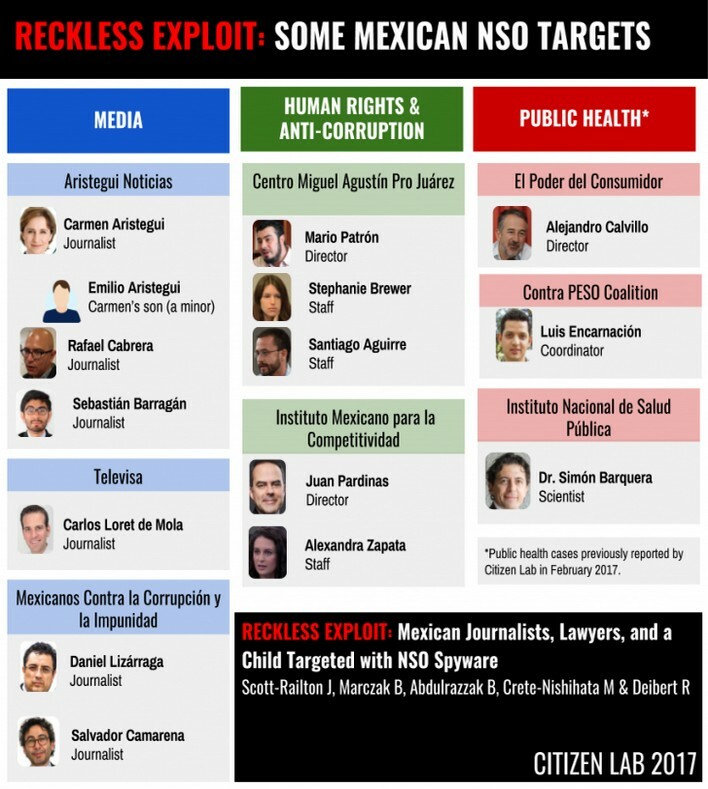 It includes 12 individuals who share a common trait: investigations into Mexican government corruption, forced disappearances, or other human rights abuses. All of the individuals who cooperated in our research consented to be named in the report. The August 2016 endpoint coincides with the time of our disclosure to Apple about NSO’s exploits, which led to the shutdown of NSO’s infrastructure (or at least that particular phase of it). Among the noteworthy aspects of this latest case are the persistent and brazen attempts by the operators to trick recipients into clicking on links. Each of the targets received a barrage of SMS messages that included crude sexual taunts, alleged pictures of inappropriate, threatening, or suspicious behavior, and other ruses. Many received fake AMBER Alert notices about child abductions as well as fake communications from the US Embassy in Mexico. Our report makes it clear that the NSO Group, like competitor companies Hacking Team and FinFisher, is unable or unwilling to control the abuse of its products. Time and again, companies like these, when presented with evidence of abuse, effectively pass the buck, claiming that they only sell to “government agencies” to use their products for criminal, counterintelligence, or anti-terrorism purposes. The problem is that many of those government clients are corrupt and lack proper oversight; what constitutes a “crime” for officials and powerful elites can include any activity that challenges their position of power — especially investigative journalism. NSO Group is an Israeli company, and thus subject to Israeli law. In the past, Israel has prided itself on strict export controls around commercial surveillance technology. Yet this latest example shows yet again the ineffectiveness of those controls. Will Israeli lawmakers tighten regulations around NSO Group in response? Among the checklist of measures McKune and I identified is the importance of evidence-based research on the commercial spyware market to help track abuses and raise awareness. It is important to underline that the work undertaken in this report could not have been done without the close collaboration between Citizen Lab researchers and Mexican civil society groups, R3D, SocialTic, and Article 19. Collaborations like these are essential to exposing the negative externalities of the commercial spyware market, documenting its harms, and shedding light on abuse. DAMASCUS – As the drive to push ISIS out of its remaining territories in Syria and Iraq rapidly advances, the U.S. and its allied forces have entrenched themselves in the southeastern Syrian border town of al-Tanaf, cutting off a major highway linking Damascus to Baghdad. Defeating ISIS is Washington’s only stated military objective inside Syria. So what are those American troops doing there, blocking a vital artery connecting two Arab allied states in their own fight against terrorism? “Our presence in al-Tanaf is temporary,” says Col. Ryan Dillon, spokesman for the Combined Joint Task Force of Operation Inherent Resolve (CTFO-OIR), the U.S.-led campaign against ISIS, via phone from Baghdad. But since May 18, when U.S. airstrikes targeted Syrian forces and their vehicles approaching al-Tanaf, American forces have shot down two Syrian drones and fired on allied Syrian troops several times, each time citing “self-defense.” In that same period, however, it doesn’t appear that the al-Tanaf-based U.S.-backed militants have even once engaged in combat with ISIS. She has a point. Under international law, any foreign troop presence inside a sovereign state is illegal unless specifically invited by the recognized governing authority – in this case, Assad’s government, the only Syrian authority recognized by the UN Security Council. Uninvited armies try to circumvent the law by claiming that Syria is “unable or unwilling” to fight ISIS and the threat to international security it poses. But “unwilling and unable” is only a theory, and not law, and since the Russians entered the Syrian military theater to ostensibly fight ISIS with the Syrians, that argument thins considerably. It’s not clear who made the U.S. arbiters of such a ruling. Syria’s fight against ISIS has picked up considerably in recent months, since four “de-escalation zones” were established during May negotiations in Astana among Russia, Turkey, and Iran. Reconciliation agreements among government forces and some militant groups in those zones – and the transfer of other militants to the northern governorate of Idlib – has meant that Syrian allied forces have been able to move their attention away from strategic areas in the west and concentrate on the ISIS fight in the east of the country. An April 2017 report by IHS Markit, the leading UK security and defense information provider, asserts that the Islamic State fought Syrian government forces more than any other opponent over the past 12 months. In other words, during the period when IS territorial losses were most significant, Syrian forces fought ISIS more than twice as often as U.S.-backed ones. So what’s with the continued U.S. presence in al-Tanaf, an area where there is no ISIS presence and where the Syrian army and its allies have been making huge progress against their militant Islamist opponents? If you look at the map commissioned by the author above, there are approximately three main highway crossings from major Syrian centers into Iraq. The northern-most border highway is currently under the control of U.S.-backed Kurdish forces who seek to carve out an independent statelet called Western Kurdistan. The Homs-to-Baghdad highway in the middle of the map cuts through ISIS-besieged Deir ez-Zor, where up to 120,000 civilians have been protected by some 10,000 Syrian troops since ISIS stormed its environs in 2014. 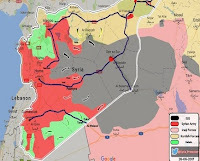 While that border point to Iraq is currently blocked by the terror group, Syrian forces are advancing rapidly from the west, north, and south to wrest the region back from ISIS control. The Damascus-to-Baghdad highway in the south of the country, which allied Syrian forces have largely recaptured from militants, could have easily been the first unobstructed route between Syria and Iraq. Until, of course, U.S.-led forces entrenched themselves in al-Tanaf and blocked that path. The Syrians cleared most of the highway this year, but have been inhibited from reaching the border by a unilaterally-declared “deconfliction zone” established by U.S.-led coalition forces. “It was agreed upon with the Russians that this was a deconfliction zone,” says CJTF spokesman Dillon. Since regime-change plans fell flat in Syria, Beltway hawks have been advocating for the partitioning of Syria into at least three zones of influence – a buffer zone for Israel and Jordan in the south, a pro-U.S. Kurdish entity along the north and north-east, and control over the Syrian-Iraqi border. But clashes with Syrian forces along the road to al-Tanaf have now created an ‘unintended consequence’ for the U.S.’s border plans. Syrian allied troops circumvented the al-Tanaf problem a few weeks ago by establishing border contact with Iraqi forces further north, thereby blocking off access for U.S. allies in the south. And Iraqi security forces have now reached al-Waleed border crossing, on Iraq’s side of the border from al-Tanaf, which means U.S.-led forces are now pinned between Iraqis and Syrians on the Damascus-Baghdad road. If the U.S. objective in al-Tanaf was to block the southern highway between Syria and Iraq, thereby cutting off Iran’s land access to the borders of Palestine, they have been badly outmaneuvered. 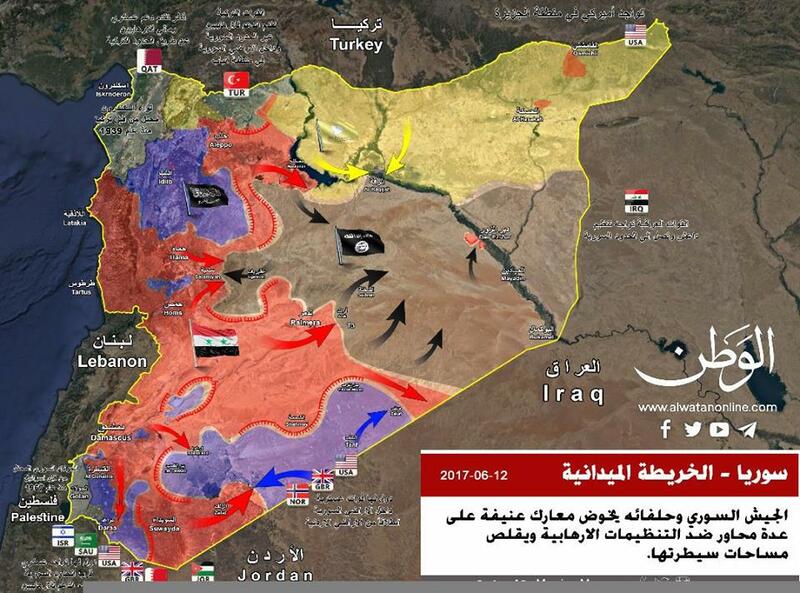 Syrian, Iraqi, and allied troops have now essentially trapped the U.S.-led forces in a fairly useless triangle down south, and created a new triangle (between Palmyra, Deir ez-Zor, and Albu Kamal) for their “final battle” against ISIS. He and others in Damascus remain optimistic that the border routes long been denied to regional states will re-open in short order. “Through the era of the Silk Road, the pathway between Syria, Iran, and Iraq was always active – until colonialism came to the region,” explains Turk Abadi. “In the history of the last half century, it was always prevented for Syria and Iraq to get close, to coordinate. When (former Syrian president) Hafez al-Assad and (former Iraqi president) Ahmed Hassan al-Bakr almost reached a comprehensive agreement, Saddam Hussein made a coup d’etat and hung all the officers who wanted rapprochement with Syria,”says Shaaban, who has just published a book on Hafez Assad’s dealings with former U.S. Secretary of State Henry Kissinger. Saddam then launched an eight-year war against the Islamic Republic of Iran, and the latter lost road access through Iraq for more than two decades. In early 2003, U.S. troops invaded Iraq, deposed Saddam, and occupied the country for the next nine years. During that era, Iranian airplanes were often ordered down for inspections, instigated by U.S. occupation forces interested in thwarting Iran’s transfer of weapons and supplies to the Lebanese resistance group Hezbollah and other allies. By the time U.S. troops exited Iraq in late 2011, the Syrian conflict was already under way, fully armed, financed, and supported by several NATO states and their Persian Gulf allies. “When those borders are re-opened,” says Asadollahi, “this will be the first time Iran will have a land route to Syria and Palestine” – though others point out that the Iranians have always found ways to transport goods undetected. “Our army is now almost at the border and Iraqis are at their border – and we are not going to stop,” insists Shaaban. Syrian and Iraqi forces have not yet checkmated American forces operating in their military theaters. There is still talk of an escalation that may pit the United States against Syria’s powerful Russian ally, a dangerous development that could precipitate a regional or global war. The fact is, US-trained militants in the al-Tanaf garrison are not fighting ISIS today, and they suffered a “crippling defeat” in June 2016 when they last launched a major offensive against the terror group, 200 miles from al-Tanaf. 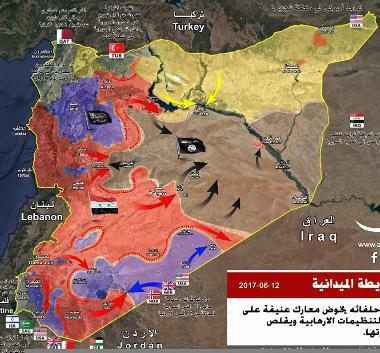 Factoring in geography, balance of field forces and momentum, it is implausible that US troops and their proxies on the southern Syrian-Iraqi border can achieve their stated objectives. It is time for them to surrender their positions to the Syrian state. Ottawa - The Supreme Court of Canada has declined to hear two appeals that sought to delay the Site C dam project in British Columbia. Two First Nations — the Prophet River and West Moberly First Nations — had sought a judicial review of the mega-project, citing problems with how it was approved by the provincial and federal governments. The two First Nations say proper consultations were not carried out during the approval process and that adverse affects from flooding would significantly impair how they exercise their treaty rights. The applications were dismissed with costs today. As usual, the Supreme Court of Canada gave no reasons for its decision not to hear the cases. The claims have been previously dismissed by the provincial Supreme Court of B.C. and the Federal Court of Appeal. 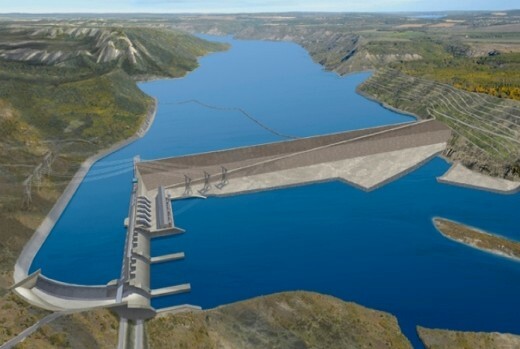 In their decision, the Federal Court of Appeal ruled the federal government is allowed to issue permits for projects like Site C without first discovering if the project violates treaty rights. There are too many awards for journalism. Too many simply celebrate the status quo. 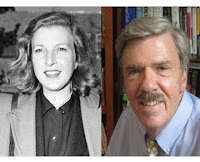 The idea that journalists ought to challenge the status quo - what Orwell called Newspeak and Robert Parry calls 'groupthink' - is becoming increasingly rare. More than a generation ago, a space opened up for a journalism that dissented from the groupthink and flourished briefly and often tenuously in the press and broadcasting. Today, that space has almost closed in the so-called mainstream media. The best journalists have become - often against their will - dissidents. Martha was renowned as a war reporter. Her dispatches from Spain in the 1930s and D-Day in 1944 are classics. But she was more than that. As both a reporter and a committed humanitarian, she was a pioneer: one of the first in Vietnam to report what she called 'a new kind of war against civilians': a precursor to the wars of today. She was the reason I was sent to Vietnam as a reporter. My editor had spread across his desk her articles that had run in the Guardian and the St Louis Post-Dispatch. A headline read, 'Targeting the people.' For that series, she was placed on a black-list by the US military and never allowed to return to South Vietnam. She and I became good friends. Indeed, all my fellow judges of the Martha Gellhorn Prize - Sandy and Shirlee Matthews, James Fox, Jeremy Harding - have that in common. We keep her memory. She was indefatigable. She would call very early in the morning and open up the conversation with one of her favourite expressions - 'I smell a rat'. My phone rang. 'I smell a rat', said a familiar voice. Within 24 hours Martha was on a plane to Panama. She was then in her 80s. She went straight to the barrios of Panama City, and walked from door to door, interviewing ordinary people. That was the way she worked - in apartheid South Africa, in the favelas of Brazil, in the villages of Vietnam. The administration of Ronald Reagan had secretly and illegally sold weapons to Iran in order to secretly and illegally bankroll a bloodthirsty group known as the Contras, which was then trying to crush Nicaragua's Sandinista government - on behalf of the CIA. You could barely make it up. Bob Parry's career has been devoted to finding out, lifting rocks - and supporting others who do the same. In the 1990s, he supported Gary Webb, who revealed that the Reagan administration had allowed the Contras to traffic cocaine in the US. For this, Webb was crucified by the so-called mainstream media, and took his own life. Lifting the big rocks can be as dangerous as a war zone. In 1995, Parry founded his own news service, the Consortium for Independent Journalism. But, really, there was just him. Today, his website consortiumnews.com reflects the authority and dissidence that marks Parry's career. What he does is make sense of the news - why Saudi Arabia should be held accountable; why the invasion of Libya was a folly and a crime; why the New York Times is an apologist for great power; why Hillary Clinton and Donald Trump have much in common; why Russia is not our enemy; why history is critical to understanding. 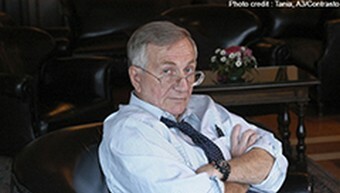 Monday, award-winning journalist Seymour Hersh exposed the U.S.’ justification for bombing the Syrian government in April as having been based on a lie. But the U.S. is still using the same debunked justification to target not only the Syrian government, but also Russia and Iran. 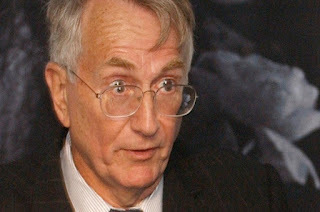 On Monday, Pulitzer-prize winning journalist Seymour Hersh – best known for breaking some of the biggest stories of the Vietnam and Iraq wars – managed to prove the Trump administration’s decision to bomb Syrian government territory was based on false pretenses, entirely unsupported by U.S. military intelligence. The bombing, which saw 49 Tomahawk missiles hit a largely defunct Syrian airbase, was a response to the Trump administration’s claim that the Syrian government had carried out a sarin gas attack on civilians in the al-Nusra Front-controlled town of Khan Sheikoun in Syria’s Idlib Province last April. But as Hersh revealed, Trump issued the order to target the airbase even though the entire U.S. intelligence community had already told him that they had no evidence that the Syrian government had used a chemical weapon in Idlib. In addition, a senior adviser to the U.S. intelligence community told Hersh that he is concerned that Trump will respond with military force every time there is even an accusation of the Syrian government using chemical weapons, regardless of the presence of evidence. “The issue is, what if there’s another false flag sarin attack credited to hated Syria? Trump has upped the ante and painted himself into a corner with his decision to bomb. 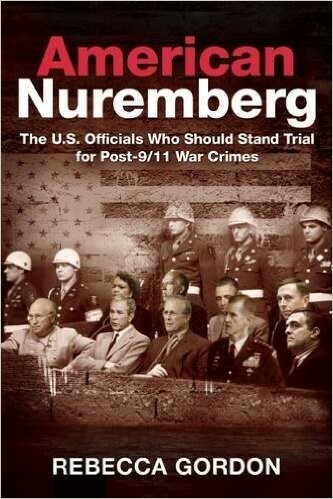 And do not think these guys are not planning the next faked attack,” the adviser told Hersh. Spicer also noted that the alleged activity taking place was “similar to preparations the regime made before its April 4, 2017 chemical weapons attack.” The White House also warned that the Syrian government will pay a “heavy price” if another similar attack takes place. The Trump administration’s claims regarding these “preparations” lack credibility, as no evidence to support its claims about the April gas attack has been presented to date. In addition, according to The Associated Press, numerous state department officials who are normally involved in coordinating such statements were apparently unaware of the White House’s warning. The Associated Press also noted that the warning did not appear to have been discussed in advance with other national security agencies, even though the Pentagon, U.S. intelligence agencies and the State Department are typically consulted before the White House issues any declarations that could have a major impact on U.S. foreign policy. Haley’s tweet suggests that any attack in which Syrian civilians are killed, whether it is committed by the Islamic State or the U.S. itself, could be blamed on Assad. The U.S. recently used chemical weapons in Syria and killed over 400 Syrian civilians just last month with no international outcry. It seems that the possibility of a false flag chemical weapons attack taking place in Syria is no longer an “if,” but a “when.” With intense U.S. military reconnaissance already taking place along the Syrian coast and U.S. allies falling into place to support any action the U.S. may take, existing tensions in Syria are about to become even more heated. Are Trump's "Chemical Attack" Charges Another Prelude to Broadened Syria War? Is Trump's 'Warning' to Syria a Prelude to Another Strike? The US has issued a new threat to Syria over chemical weapons. On Monday, the White House said it believes Syrian President, Bashar al-Assad, is preparing a new chemical weapons attack and that he would pay a heavy price if one takes place. That statement appeared to catch the Pentagon off guard, but on Tuesday, military officials said the US had picked up chemical weapons activity at the same airbase that the US bombed in April. Syria and Russia have rejected the claim and call it a provocation. The US has been ramping up military operations inside Syria, recently shooting down a Syrian warplane and increasingly targeting Iranian-backed forces. The Washington Post reports that Senior White House Officials are "focused as much on Iran as on the Islamic state." Award-winning author and journalist Max Blumenthal says that with its recent military escalation in Syria and its backing of Saudi Arabia, the Trump administration might be de-prioritizing the fight against ISIS in order to confront Iran. America at War Since 9/11: Reality or Reality TV? Or you could come across statistics two orders of magnitude larger in learning from a variety of sources that famine is stalking 17 million people in Yemen. That is the predictable result of a Saudi Arabian proxy war against Iran, a campaign supported by the U.S. with weaponry and logistical assistance, in which, according to Human Rights Watch, the U.S. may well be complicit in torture. You could contemplate the fact that in Iraq, a country the United States destabilized with its 2003 invasion and occupation, there are still at least three million internally displaced people, according to the U.N. High Commission for Refugees; or that more than 411,000 Iraqis remain displaced from their homes in Mosul alone since the Iraqi army launched a U.S.-backed offensive to drive ISIS out of that city last October. How could it be real? Most of us no longer have any idea what war is like for the people who live through it. No major war has been fought on U.S. territory since the Civil War ended in 1865, and the last people who remembered that terrible time died decades before the turn of this century. There is no one around to give us a taste of that reality -- except of course for the refugees that the Trump administration is now doing its best to keep out. We think of wars, reasonably enough, as primarily affecting the soldiers engaged in them. The young men and women who fight -- some as volunteers and some who choose military service over unemployment and poverty -- do sometimes die in “our” wars. And even if they survive, as we now know, their bodies and psyches often bear the lifelong scars of the experience. And there were the young women who told the class that, in fear, they’d had to move out of their homes because their boyfriends came back from the wars as dangerous young men they no longer recognized. If we in this country know anything real about war, it’s from people like these -- from members of the military or those close to them. Still, daily life in a country at war isn’t all screams and stench. A lot of the time it’s just ordinary existence, but experienced with a kind of double awareness. On the one hand, you send your children to school, walk to the market to do your shopping, go out to your fields to plow or plant. On the other, you know that at any moment your ordinary life can be interrupted -- ended, in fact -- by forces over which you have no control. All that day, we’d been digging to help build Jalapa’s refugio, an underground shelter to protect children and old people in case of an aerial attack. Other town residents had been planting trees on the denuded hillsides where Somoza had allowed U.S. and Canadian lumber companies to clear-cut old-growth forest. This was dangerous work; tree planters were favorite contra targets. But most people in town were simply going about their ordinary lives -- working in the market, washing clothes, fixing cars -- while the loudspeakers on the edge of town blared news about the latest contra kidnappings. Many rural Nicaraguans lacked electricity and running water, so there was no great harm done when “se fue la luz” -- the electricity was cut off, as often happened when the contras attacked a power generator. Worse was when “se fue el agua” -- the water in people’s homes or at communal pumps stopped running, often as a result of a contra attack on a pumping station or their destruction of water pipes. Still, for the most part, these were unpleasant inconveniences in a rural society where electricity and running water were not yet all that common, and where people knew how to make do without. Imagine instead that you live (or lived) in a major Middle Eastern city -- say, Ramadi, Fallujah, Mosul, or Aleppo (all now partially or nearly totally reduced to rubble), or even a city like Baghdad that, despite constant suicide bombings, is still functioning. Your life, of course, is organized around the modern infrastructure that brings light, power, and water into your home. In the United States, unless you live in Flint, Michigan, it’s hard to grasp what it might be like not to have potable water dependably spilling out of the faucet. If Vietnam was the first televised war, then the 1991 Gulf War against Saddam Hussein’s Iraq was the first video-game-style war. Who could forget the haunting green images of explosions over Baghdad on that first night (even if they've forgotten the 50 “decapitation” strikes against the Iraqi leadership that killed not one of them but dozens of civilians)? Who could forget the live broadcasts streamed from video cameras attached to “smart” bombs -- or the time two of them demolished what turned out to be a civilian air raid shelter, killing more than 200 people hiding inside? Who could forget those live reports from CNN that gave us the illusion that we were almost there ourselves and understood just what was seemingly unfolding before our eyes?